Originally from Sun Prairie, Wisconsin, Georgia O'Keeffe aspired to becoming an artist at an early age. She attended the Art Institute of Chicago in 1905, a year later moving to New York to study at the Art Students League. In 1908, O'Keeffe attended an exhibition of Rodin's watercolors at the 291 Gallery owned by world renowned modernist photographer, and her future husband, Alfred Stieglitz, though by all accounts, they did not meet that evening. Discouraged with the development of her artwork, she chose not return to the Art Students League the following autumn, instead moving to Chicago where she worked as a commercial artist. For several years following, she did not paint at all, claiming that the smell of turpentine made her sick. O'Keeffe was eventually inspired again when, having accepted a two-year position as supervisor of art in the public schools of Amarillo, Texas, she fell in love with the desert. She wrote about long walks on narrow paths in a canyon near the town where she lived. The dangerous climbs in and out of the canyon were like nothing she had known before. Many of her later paintings would be born from these experiences. She finally began to paint again in 1912, when she attended a class at the University of Virginia Summer School. There she was introduced to the avant garde techniques that would bring her both fulfillment in her work, and fame as a modernist painter. O'Keeffe served as a teaching assistant at the University for several years before returning to Texas to teach in the art department of the West Texas State Normal College in Canyon, just south of Amarillo. She accepted the position in order to return to the desert which had so inspired her earlier, and especially nearby Palo Duro Canyon. In 1915, O'Keeffe sent a small portfolio of charcoal drawings to her friend Anita Pollitzer in New York, telling Anita that she wanted her art to please Alfred Stieglitz more than anyone else. Pollitzer immediately took the portfolio of drawings to Steiglitz, who was very taken with the energy of her work. He decided to show the drawings. The following April, Stieglitz included ten of O'Keeffe's drawings in an exhibit at the 291. O'Keeffe had not been consulted before the exhibit and only learned about it through an acquaintance. And so it was that the first meeting of Georgia O'Keeffe and Alfred Stieglitz was a confrontation regarding the exhibition of her work without her knowledge. Ultimately, she agreed to let the drawings hang. Her first solo exhibition at 291 would take place a year later, with the majority of work being watercolors from Texas. Stieglitz became O'Keeffe's strongest supporter, and a major force behind shows of her work for the next twenty-five years. Within a few months of their meeting, the two had fallen in love. They spent their winters in New York City, and their summers at Stieglitz's home in the Adirondacks at Lake George. Seven years after their initial meeting, Alfred Steiglitz and his wife divorced, and he and Georgia O'Keeffe were married. The love Georgia O'Keeffe found in the desert of the Texas panhandle would also continue for the rest of her life. The rich, but harsh reality of the desert was the subject of many of her paintings. 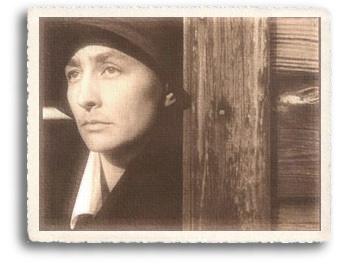 In 1930, Georgia O'Keeffe began spending most of her summers in Northern New Mexico, first as a guest of D.H. Lawrence at his ranch near Taos. Inspired by his guest, Lawrence started painting, discovering he had a talent for it as well. 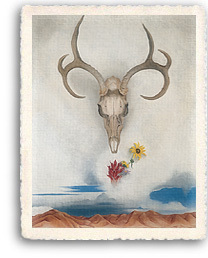 O'Keeffe's friends and acquaintances all came to know her beloved Northern New Mexico as the faraway. Inspired by her travels, she made large paintings of the flowers and bones she found during walks in the high desert which have since become icons of modern art. Most of her paintings share a largeness of subject and richness of color inspired by her surroundings. OKeeffe bought her first house in New Mexico in 1940. Stieglitz did not enjoy the heat of New Mexico summers, preferring to stay in New York. O'Keeffe continued to spend the majority of the year in New York with him until his death in 1946, when she moved to her beloved "faraway permanently. 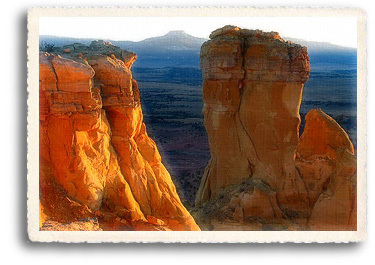 Her New Mexico home is known as Ghost Ranch, and is located in Abiquiu, (Ab-e-kew) NM. Ghost Ranch is now a center for retreats, hiking, art, classes and contemplation.